by Joseph J Clark Sr.
Hi my name is Joe. My project is Barb2, the name on my license tag Barb1 is in my garage on my "05" 1200 custom sporty. God and my wife were looking down when I applied for these two specialty tags. Barb was my late wife. I took my 05 custom to (That I won at a car dealer raffle)to Nick's custom cycles in Williamstown NJ to ask about stretching it out. The owner Nick told me I was crazy because the bike was beautiful the way it was. It is chrome from end to end. After talking for a while he said do you have a minute and we went to one of his buildings in the rear. He showed me a 2006 883L sporty with front end damaged. A guy bought it (in Atlanta new)and drove 5 miles and hit a dump truck. Nick bought it at an auction not a salvage title but clear title. He said if you want to stretch and customize a bike this was the way to go. Five miles on the engine and nothing wrong from engine back. Of course I could always go into his showroom,by an iron horse,or an other custom bike from him and pay 32 to 35 grand but everybody else can too. If you do it yourself its one of a kind. So I bought it for 37 hundred with the notion of,rake the front end and customize here and there. I figured id spend about 12 thousand including the price of the bike well as I started the project one thing led to another and here is some of what nicks custom and I did. coated cylinders) for performance & heat. There performance pistons,rings,pins,and stronger S&S rods C.R 10.5:1 they balanced everything to a 60% factor. When it came back J.D and I had already decided to go all the way. Next was a set of anders new N9's,cranes ADJ chromemoly push rods the values have to be re-grounded, reseated heads too for clearance, A screamin eagle performance spring kit, A mikuni HRS42,A hypercharged on it ,and bassami sweepers. The new nicon cyclinder,heads,headbolt bridges, and voltage regulator were painted black and shipped to Las Vagas to "Diamond Heads" everything was diamond cut. They are beautiful and the price unreal. 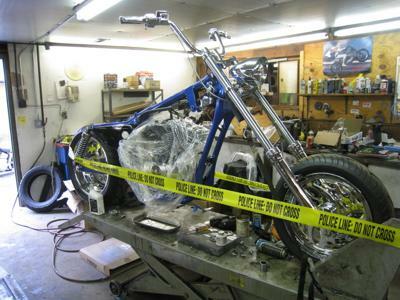 I had stripped the bike down to the frame and engine myself. Nick told me in the beginning this would save me a lot of labor costs. The frame was cut stretched 3 1/2" inches and a 44 degree rake a wide glide front and went on with a 120/80 R16 front avon & a 200/55 R18 on the rear on inferno wheels. Anything not used on the frame was removed,like the rear passenger & mid control brackets. And fender struts. The steel rear fender is self supported. Nick's painter( Joey the painter) added some steel sculptures to the downtubes to make it a one of a kind frame. As you can figure that 12 grand I was gone to spend jumped to 30 or a little more. The 883cc bike I started with is now 1450cc and roughly about 108 to 110 HP. The HP and torque will be figured out on a computer program when the bike is all done in about 3 weeks. The hold up is a inner rocker cover that had to go back to the chromer in Califorina because of a slight flaw it should be here tomorrow. I gave everyone working on the project a camera so we have start to finish pictures on a CD. Oh yes the paint will be Blue with True Fire done in blue. The tank, fenders, side covers, and a helmet to match.